For those people that enjoy a carefully made cup of espresso they will know that it is really important to have an authentic cup from which to drink the strong coffee. Espresso cups are those little coffee cups that can be anything from plain porcelain to more ornate designs. 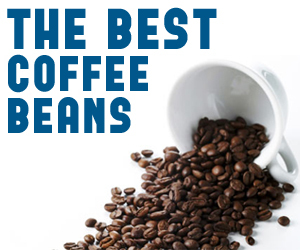 The cup makes a difference to enjoying an espresso – so if you take the time to make this spectacular beverage – make sure you have the perfect espresso coffee cups to serve it to your dinner guests or yourself for that matter. We have selected a number of ranges of espresso cups for you to consider, we are not however recommending any one particular design but are hoping to show you how a cup can change the whole process of drinking espresso. 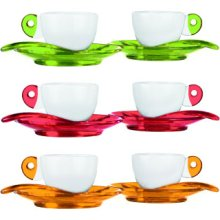 These espresso cups in the Guzzini range are designed by Queensberry Hunt Levien and are available as a set of 2 in green, red or gold. Available for around £18 for two they will add a touch of contemporary class to a dinner party. For the office these espresso cups are ideal for business meetings. Customers will be impressed when served coffee in these cups. First impressions are very important and to serve espresso in these great cups could help seal the deal. The cups are by Present Time and retail at around £14 for the set. 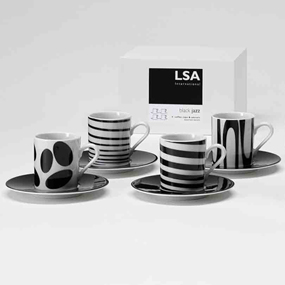 LSA International has designed a very style espresso cup set – the Jazz range is perfect for dinner parties. Guests will be impressed when they are served after dinner coffee in these cups and sauces. They are extremely reasonably priced for a set of 4 at £28. Wow – look at this striking red cup. This is in true oriental design – Shanghai Espresso Cup and Saucer is available for approximately £7 per cup and saucer. This is a beautiful cup for those special occasions when only a strong espresso will do. 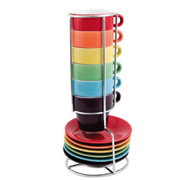 We have highlighted here a few of the amazing espresso coffee cups that are available. As is clear there is now no need to have your coffee in a plain white cup – there are some fantastic designs that will make an individual cup enjoyable and there are ranges that will impress in a business setting when sealing that important deal and there are some beautiful cups that will be perfect at home for after dinner coffee too.